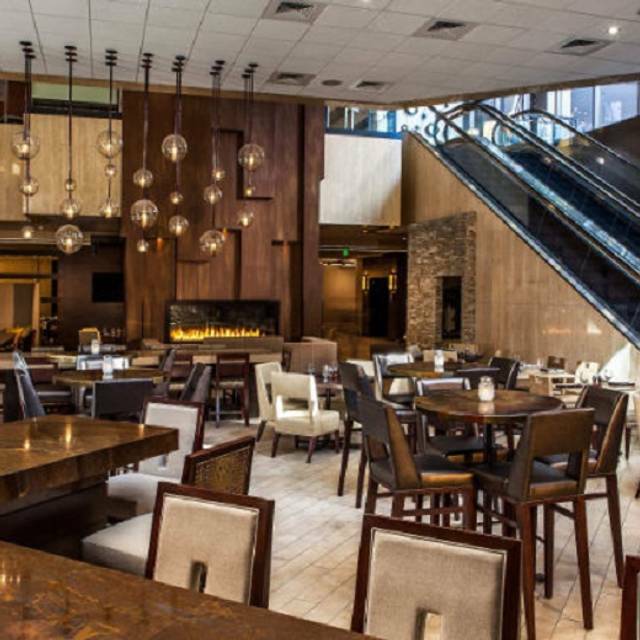 Prospect's is a hidden gem on the lower level inside the Hilton Denver City Center in the heart of downtown Denver. 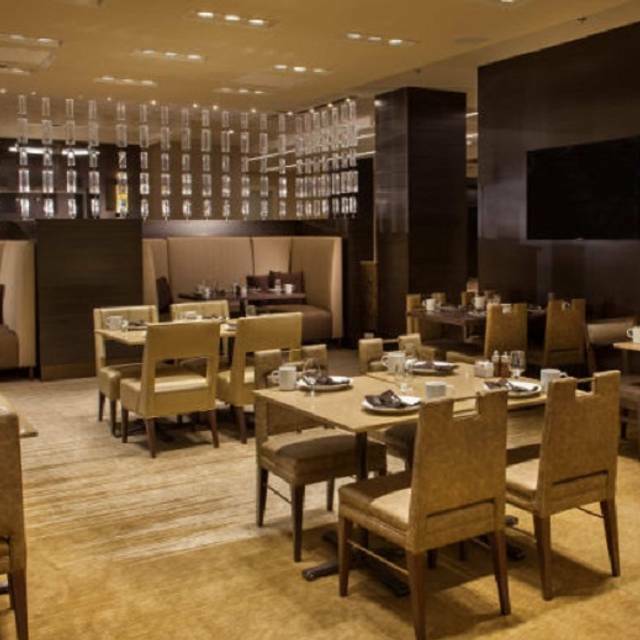 The classy yet casual atmosphere offers exceptional service, elegant cuisine and a wide section of local brews. If you are looking for the quiet table by the fire or to catch the game on their big screen, you will not be disappointed. Food was excellent. Bartenders were fabulous. The waitress we had was awful. We saw her twice in 2 hours. She took our order then disappeared. We had to flag down another waitress to place our order. She was wonderful but then the first waitress returned right as we were finishing to claim the tips. It was very upsetting to witness. I wish we could have tipped the waitress that actually did all the work. 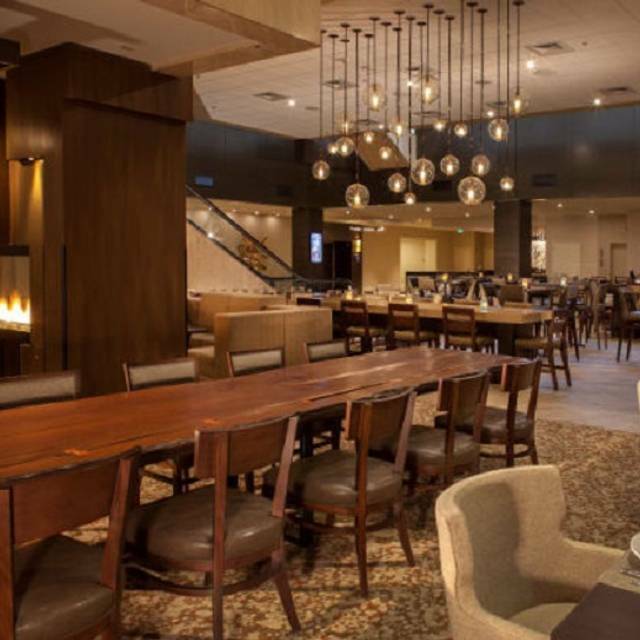 Sunken below the lobby of the Hilton Denver City Center, Prospect's is your average hotel restaurant and bar. This seat your self dining area (no OpenTable reservation required) was squished between escalators, the breakfast buffet, and hotel ballrooms. Happy Hour from 4:00pm to 6:00pm was a moderately good deal, though both it and the primary dinner menu were light on choices. For example, the only vegetarian "large plate" available was a pasta dish. Otherwise, a vegetarian could cobble together a vegetarian small plate (chips, pretzels, hummus, or fries) and salad. My date and I thought the food was good, but not a good value; the inflated prices were meant for the captive audience staying at the hotel with access to expense accounts. With so many other restaurants, even better hotel restaurants, in the area, I'd be hard pressed to recommend Prospect's to anyone, even guests of the hotel looking for a quick and convenient meal. Food was okay. Service was great. Atmosphere was a little too noisy for a business lunch. Decent hotel meal; there were some health options. A crowd came into the bar area after we were seated and as a result dinner took a very long time. Nice place. We were a large group after a long day of meetings. Food was good, service was fine. This is an open air dining location in the basement of the Hilton. The atmosphere is warm/modern and clean. We made reservations and realized we didn't need to since the place was only about 20% occupied and the 2 employees near the hostess stand didn't even address us. We sat ourselves and waited for 15 minutes with NO SERVICE... NO "HI, I'll BE RIGHT WITH YOU". There were 3 waiters and 1 bartender covering what looked to be maybe 6-8 tables... small parties. We were on a schedule so we just got up and left. One of the servers did manage a passing smile on our way out, but didn't attempt to keep us from going elsewhere. This is actually a hotel restaurant, but it has a slightly different menu for a hotel restaurant, at least. I admit when I quickly glanced at the menu (discovering this restaurant online via Open Table), I thought it was going to be something close to a brewery. The pretzels appetizer and their french onion soup are excellent. What a great hidden gem. House made food! Absolutely delicious! NYE may not be the best time to go here. Drinks were good but service was VERY slow. We have been to Prospects twice now in one month, and both times the food has been great (unique and very tasty) and the service has been wonderful! We highly recommend Prospects! I was very pleasantly surprised; food quality and options were high above expectations. Showed up with a group of seven, and from a near-perfect burger to shrimp and grits with pork belly everyone was impressed. Complemented with good bar service with cocktails and solid beers on tap (read: the bartender knew how make a real manhattan). Ambiance a little off by being in an open lower level space-but that’s more a reflection of “food this good” deserves a more prominent location in the building. We totally enjoyed dinner (7 of us). Good variety of food. It was nice to have a quiet meal where you can have a dinner conversation without shouting. Food was great. Sports were on. Easy way to decompress with coworkers. The food was slow in coming with vegetables that were cold and with steak that was overcooked. The Tempranillo was excellent and the service staff were great. Unexpectedly wonderful beer brined roasted chicken! It's a hotel bar, not the restaurant that I was expeecting looking at their website. Excellent food. Friendly attentive service. Yummy pretzel bread. Awesome steaks! Delicious bourbon pecan pie! We had an average breakfast. A little expensive for what it was but once we actually got a server- she was nice. We went to prospect for mother's day brunch. Even though breakfast service was supposed to end at 11, (about the time we were seated) they were happy to give us breakfast menus and let us order. I had a salmon spinach eggs Benedict that was delicious. The server was very friendly and helpful. Surprisingly good and reasonably priced. The location is noisy and busy. I loved having lunch here with my 19-year-old grandson, who I had not seen in several months. A nice quiet atmosphere is important for having a great conversation, and Prospects filled the bill in this way. The staff was friendly but not intrusive. Food was good, and my special needs (vegetarian) were acccommodated. One of the best dining experiences ever. Went to brunch for my son's 28th birthday on Christmas Eve and asked for a bigger table than on line reservations allowed. No problem! Andy was awesome and the Bloody Mary's were great. Naomi stopped by and took care of our special request for chicken fingers and fries for my nieces. No problem! The chef presented them in a wonderful way. The Eggs Benedict was one of the best I've ever had. The eggs were perfectly prepared and the hollandaise sauce was really fantastic. We would highly recommend this restaurant! Can't wait to go back! Thanks Andy and Naomi! It's a basement lounge in the Marriott. Too bad it's not a real restaurant. They have a great spinach and apple salad. They also have a good list of wines by the glass. Server, RACHEL, was a delight. Food was good. Portions were too small. Drinks too expensive. The only reason I'd come back is for the great attitude and friendly service from RACHEL. The food was great and the service was awesome. I will go again the next time I am in Denver. Great farm to table food. Bison, nice salads reasonable wines. Classy, but not pretentious. Staff were welcoming and made me feel comfortable having a dinner and a beer while doing work. Great place for socializing, or taking in a quiet dinner by the fireplace. Well-rounded. Exceptional staff!! Can't express profusely and effusively enough how wonderful they are.